Kahuna Kevin titled his first cocktail book “Why Is the Rum Gone?” but I think my boyfriend would call it “Where Did All This Rum Come From?” Because after taking a look at all these intricate recipes, I went out on a spending spree so that I could recreate some of his crazy concoctions. Even before I ever tried one of his drinks, I was already impressed by the passion and hard work that were apparent in producing this. The self-published book is beautifully designed, spiral-bound and printed on heavy card stock (the pages are now also coated with plastic to protect against spills), and there’s full color photos of the finished product to accompany each recipe. And how could I not be charmed by fun cocktail names like Irish Nutjob, Mary Ann & Ginger and the Truffle Shuffle? Goonies never say die! For the last year I’ve been plugging away through Beachbum Berry’s books and filling up our liquor cabinet with a modest store of light, gold and dark rums. However, Kevin specifically calls for various spiced (Kraken, Sailor Jerry, Kilo Kai), premium rums (Zaya, Diplomatico Reserva Exclusiva), and some exotic liqueurs that I’d previously never even heard of. (I still have no clue how to pronounce D’Aristi Xtabentun…) Most of the ingredients appear in multiple drinks, so it makes it a bit easier to justify springing for them. (Though if somebody wanted to buy me a bottle of Gran Duque D’Alba brandy for my birthday, I’d appreciate it.) DrinkupNY.com was helpful in tracking down some of the more obscure items, like the Rogue Spirits hazelnut rum. They used to offer free U.S. shipping for orders over $100 but now that’s only for certain states. OK back to the book. 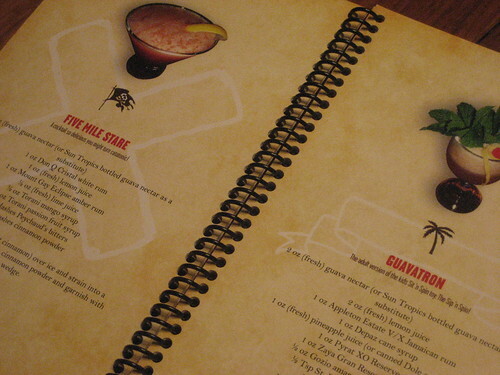 No drink has fewer than five ingredients; in fact, most of them have several more (up to sixteen in Kahuna Kevin’s Headless Zombie). With so many different flavors in play, it was sometimes hard to discern what they were all supposed to contribute to the cocktails. I’d say the Five Mile Stare is my favorite so far, along with the Beretta Vendetta. The others have mostly fallen in the middle for me, but my high expectations weren’t quite realised by the Caramel Rebellion or Bac-o-tini. (Truth be told, I find most culinary experiments involving bacon to be disappointing compared to the real deal.) I still have more to try, and I’m hoping to add to the list of keepers. If you and your liver enjoy a challenge, or you have an encyclopedic selection of booze, this will be right up your alley. 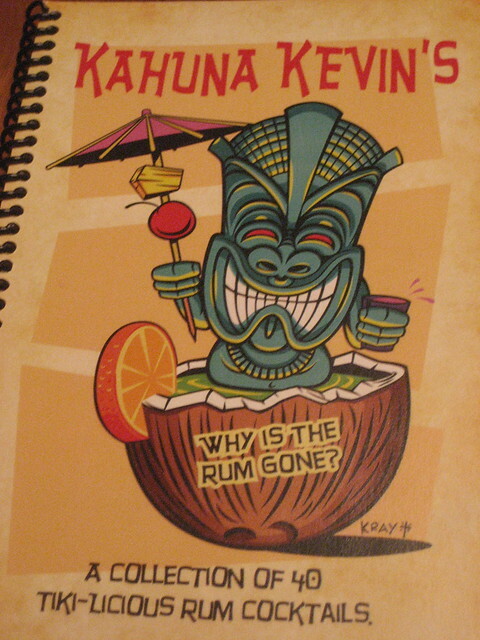 Kahuna Kevin is about to release volume two of “Why is the Rum Gone?” Both books are available to order on his web site: www.kahunakevin.com.